Read Dr. del Prado's biography here. 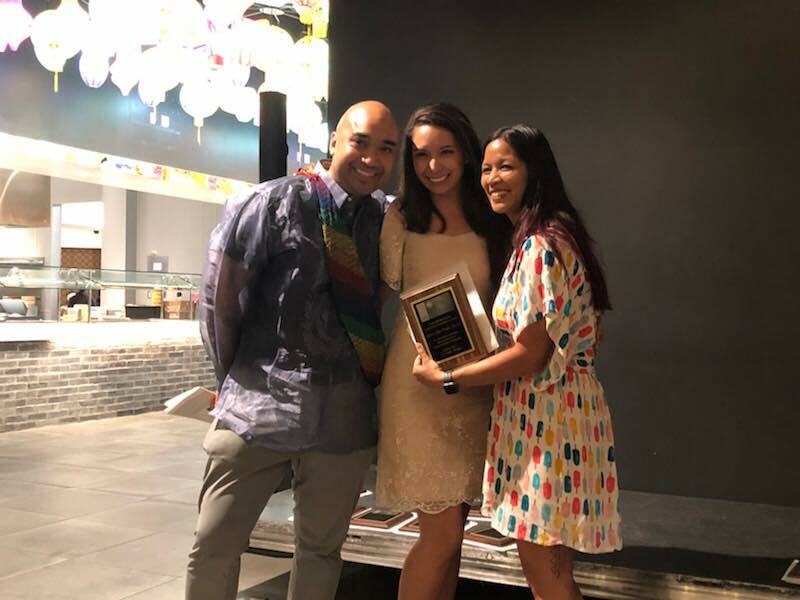 Congratulations to Dr. Alicia del Prado for being selected as the winner of the 2017 Asian American Psychological Association Okura Community Leadership Award! The Okura Community Leadership Award recognizes exemplary leadership and community service that benefits the field of Asian American Psychology and Asian American communities. Dr. del Prado received the award in Las Vegas at the annual AAPA Convention. See Dr. Chen's professional biography here. Shayna Quilty (SQ): How did you first hear about the Wright Institute, and what inspires you to stay? Stephanie Chen (SC): I’m a newbie. I was searching for another opportunity to teach and increase my teaching capacity. Dr. Torrez was a classmate of mine in graduate school, so I talked with her and it made me even more interested in the Wright Institute. The school has a great reputation, and I fell in love with the students, faculty, and administration after I taught my first class in the fall of 2015. Lucy Moore, a second-year student in the Wright Institute’s Counseling Psychology Master’s Program, is completing her field placement at the Rainbow Community Center in Concord, CA. The organization is the only LGBTQ+ community organization providing mental health services to teenagers and adults in all of Contra Costa County. It offers support to local high schools’ Gay Straight Alliance (GSA) as well as one-on-one mentoring and internal referrals to case management, counseling and therapy. “I am excited to work here because there is definitely not enough support for the LGBTQ community here because there is less resistance to hetero-normativity in Contra Costa County compared to Oakland and San Francisco,” Moore said. Click here to read about a conference presentation that Dr. Rubio gave recently. Shayna Quilty (SQ): How did you first hear about the Wright Institute? Ritchie Rubio (RR): My family had been moving around in the US and internationally, and then we came back to the Bay Area. I was really keen on establishing myself as an academic more than a clinician because it’s harder to balance being a clinician with my family. A mutual friend suggested that I contact my close friend, Dr. Torrez, who was teaching at the Wright Institute. We were classmates in our doctoral program, along with Dr. Chen. Dr. Torrez let Milena [Esherick, PsyD] know I was interested in teaching at the Wright Institute. The Counseling Psychology program is in sync with my interests in multiculturalism, social justice, and wellness. I started teaching one class, and gradually became a core faculty member, and came on board full time in January 2017. See Taquelia's professional biography here. Shayna Quilty (SQ): Congratulations on becoming a Core Faculty Member! What drew you to the Wright Institute, and what makes you stay? Taquelia Washington (TW): Thank you! I believe in synchronicity. Most of my career has worked this way. I was supervising a Wright Institute student who was doing their practicum at an organization where I have a contract position. The student shared with me that the school was looking to hire more instructors. Upon researching and learning more, I was drawn to interview and teach Multicultural Awareness and Sensitivity (MAS) as an adjunct instructor. See Dr. Clarke's professional biography here. Shayna Quilty (SQ): Congratulations on being invited to join the Full-Time Faculty! What drew you to the Wright Institute, and what makes you stay? Mary Clarke (MC): Thank you! What drew me is a friend of a friend. A close friend/colleague and I taught a course together a couple of years ago. I fell in love with the atmosphere, curriculum, and the size of the cohorts. The faculty have collaborative relationships; they show a lot of care and dedication to their work, and I felt that people were excited to have me in their community. I definitely felt welcomed. SQ: When you think back on your time at the Wright, what’s a moment that stands out to you? MC: Going to the first Core Faculty meeting and the first orientation that I attended. I felt proud to be invited to join such a quality group of professionals. Read about Dr. Ritchie Rubio here. Trauma Transformed and SAMHSA are co-hosting the Regional CANS Reflection and Focus Group in Oakland today. Facilitators will lead a discussion to share regional learning around best practices and common challenges in implementing CANS in the San Francisco Bay Area. The Child and Adolescent Needs and Strengths Assessment (or CANS) is an outcome measure used to assess for overall psychological, social, emotional, and behavioral functioning of children and youth. Dr. Ritchie Rubio, full time faculty member for the Counseling Psychology Program at the Wright Institute, will be presenting his work on data reflection in the Child, Youth, and Families system of care of San Francisco. Over the course of decades researching the effects of solitary confinement on prison inmates, Professor Emeritus Terry Kupers, M.D. has amassed hundreds of anecdotes that illuminate the ways in which isolation causes disturbing patterns in relatively stable people and exacerbates symptoms of mental illness in those with histories of trauma and psychological problems. One such story was that of a woman he met in an East Coast prison who had recently been moved out of a secure housing unit (SHU), or solitary confinement. See Ulash's professional biography here. Shayna Quilty (SQ): I’m curious how you first heard about the Wright Institute, and what keeps you invested? Ulash Thakore-Dunlap (UTD): I first heard about the Wright Institute when I was lobbying on capitol hill representing the Asian American Psychological Association. I was sitting at a table with representatives from California and sitting next to me was Dr. Gilbert Newman, Dean of the Clinical Psychology program at the Wright Institute. Dr. Newman put me in touch with [the Director of the Counseling Psychology Program,] Dr. Milena Esherick, when I asked if there were opportunities for me to teach at the Wright. What keeps me invested is the intimate connection of our faculty. The support of the administration and the faculty allows me to do really good work with the wonderful students. Shayna Quilty (SQ): Tell me about how you became involved with the Wright Institute, and what keeps you invested? Nancy Ulmer (NU): I had never taught before, but neuroscience is one of my areas of interest, so I accepted the offer to teach Human Development the first year that the Counseling Psychology Program was in existence. Later I began teaching Addictions Counseling and Professional Development as well. We had such a fun time in the early years of the the Wright Institute Counseling Psychology Program! It was energizing, and kept me studying, learning, and growing. The students at the Wright Institute are wonderful, and I’m so pleased with our focus on professional development.